Bug! 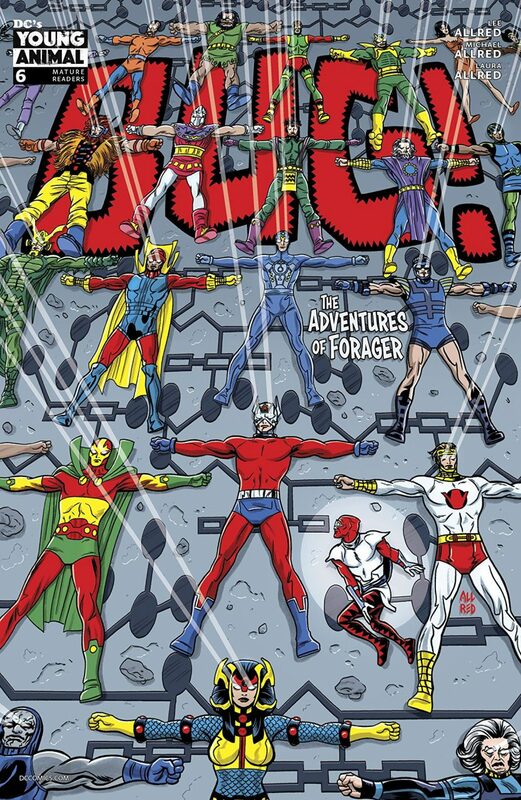 The Adventures of Forager #6 is a beautiful mess that closes the miniseries with a string of unexpectedly profound musings about mortality, perspective, and good vs. evil. Yes, it’s a lot, but it’s somehow not too much. We begin this issue as Bug chases Chagra (who is a carbon copy of Metron) to the home of the New Gods—New Genesis —which has been turned into a Life/Monopoly-style board game. (If none of that made sense, welcome to reading Bug!) All the New Gods are useless game pieces, so Bug is on his own. Chagra tries to convince Bug that he’s dying and everything in the series so far—including the talking teddy bear Hu Li and the psychic ghost girl Kuzuko—has been a hallucination. Chagra gives himself away, though. He’s actually Metron himself, attempting to fool Bug into destroying his clone. It turns out that all Chagra wants is to be fully human, not a digital copy of Metron. Metron isn’t having any of that, though. Bug realizes that Chagra has been “the real hero of this whole adventure” by foiling the plots of the other villains they’ve encountered. As Chagra makes himself human and New Genesis is returned to normal, Bug steps into the Source Wall and meets the Source (kind of like God) himself. The Source reveals that Bug has been acting as a babysitter (or governess, as Hu Li the teddy bear says) the whole time. Hu Li is actually the Source’s brother, and Kuzuko his daughter. We also find out that Kuzuko’s mom is the Mother of Mother Box fame. In a truly touching scene, we see that Bug has become a big brother to Kuzuko, who finally opens up and speaks in the end. So Bug, who never truly fit in with the other bugs or on New Genesis, has found a new home and family with possibly the most powerful and interesting people in his universe. Bug! begs to be digested all at once as opposed to issue-by-issue purely because of its absurdity, and, especially if one isn’t familiar with the New Gods. But this final installment is the most accessible of the six books. 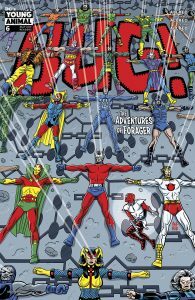 Lee and Michael Allred have managed to tell a story that confuses, intrigues, and entertains while posing questions that don’t necessarily always need answers. Some of their choices seem weird for the sake of being weird, which is honestly a very “Young Animal” trait. If you’re into that, it’s awesome. If you want everything to be buttoned up and clear, this is not your story at all. Even if you don’t follow the twists and turns of this issue, the art is a wonder. Laura Allred’s colors specifically make the book extremely pleasing to the eye, especially when we catch glimpses of the game board version of New Genesis. Her work really gives the book life. But the story is indeed a good one if you can follow it through. Meta as it may be, it all comes down to perspective in the end. Until this issue, Chagra was positioned as the villain, but one new piece of information changes all of that. Without this reveal, the point of the series is completely lost and it’s just a bunch of nonsense and magic dominoes (which is fine, but not impactful in the slightest). In a tumultuous time of “fake news” and pathological lying by government officials, this seems like a very poignant message to send, especially from a god-like figure. It’s bold for such a surrealist book, but it makes it all the more important. So while Bug! The Adventures of Forager is a fanciful romp into the obscure and odd, it’s also grounded in a human story about acceptance, perspective, and truth.